Have you ever been confused about something and then a new perspective helped bring new light or insights to your problem? Well, that is exactly what happened the other day at the site. While we are working, we are constantly talking about what we are finding, how deep the artifacts are located, where soil changes occur, and general patterns we are starting to see. One thing we have discussed is the high amount brick and bone we have recovered that clearly is concentrated in an area to the west of the rear door. Our working hypothesis was that this may have been from the destruction of the summer kitchen — the one-story addition added to the rear of the house that was replaced with a screened in “palisade” sometime in the 1910s. Perhaps, we thought, this was located near the rear door of that kitchen and they just threw everything out of the back door? A couple of days ago, however, we were discussing a unit Jill has excavated inside of the house. I walked over to the small square window and looked down. Guess what I was directly above? The main concentration of bone and brick! It now appears that the residents of the house threw at least some of their trash out of that window where it landed directly below. A little mystery solved and all it took was a different perspective. The little window with the four bone-and-brick units below. We have not recovered any whole bottles at this site. 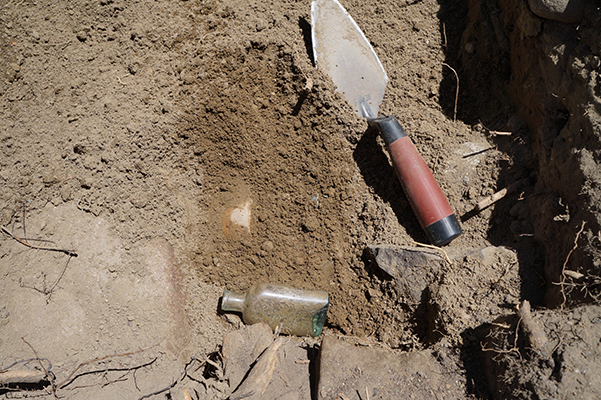 Here is one that Elena excavated from her site yesterday. 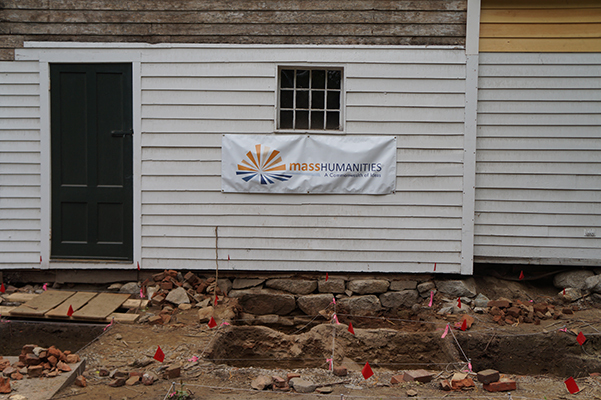 Keeping track of where it was located, what artifacts were around it, and how deep it was found will help us understand the lives of the female residents of this house.